Again, thanks Jan for translating to Dutch my poem. werd geschampt door een passerende auto. hoorde niets meer dan alleen een lichte tik. op de grond midden op de weg. One of my favourite genres is science fiction. Last week I watched on dvd three movies: I am legend (2007), directed by Francis Lawrence, Invasion of the body snatchers (1956) directed by Don Siegel, and Perfect Creature, directed by Glenn Standring (2006). I am legend (starring Will Smith) and Perfect Creature both treat the vampire issue. 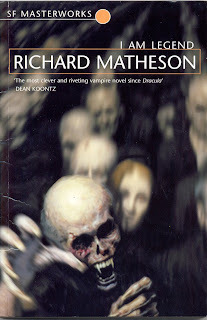 The movie I am legend caught my attention and so I ordered the novel by Richard Matheson (see http://en.wikipedia.org/wiki/Richard_Matheson) which was published in 1954. People who saw the movie weren't happy, especially those who read the novel before. Now I know why. Personally I found the movie gripping and having a nice mix of sci-fi, fantasy, horror, drama. But it is very different from the original novel of Matheson. I liked the novel more as it is a good read, very flowing (only 160 pages), and a classic. As good sci-fi books, this one seems to treat a remote issue or reality, but in fact it discusses present day problems such as isolation, solitude, evolution, different perspectives and interpretations, biological warfare and mutation. Summary on the back cover of the novel (Gollancz Publications): "An SF novel about vampires... Robert Neville is the last living man on Earth... but he is not alone. Every other man, woman and child on the planet has become a vampire, and they are hungry for Neville's blood. How long can one man survive like this?" Two other short novels which are a good read are The Fifth Child and Ben, in the World by Doris Lessing. 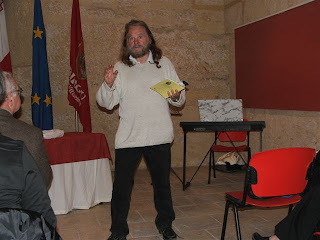 Last 22nd February the Maltese Poets Association (http://www.ghpm.netfirms.com/) of which I am vice-President organized a Poetry Evening in Birgu (Malta). As usual members of the Association and the public in general were invited to read their poetry in different languages or just to listen and have a nice evening. Even though I was not present, I got to know that for this Poetry Evening there was a special guest, poet and artist Stephen Morris, who talked about his experiences as an artist and read some of his verse. And the evenings come in early. In ritualistic dances of death. And quietly dreading the day ahead. And the squirrels hide for Winter. Towards a new year and the finality of death. Deeply, towards a greater good. This provides the eternal dilemma. Making you worse than your vanguished. To concede a truce of false promises.